Today, noodle is the most universal food that has ever spread world wide. Various kind of noodles which are represented especially by Korea Traditional Noodle, Ramen, Udon, Spaghetti, Vietnamese Pho etc., have already settled themselves as foods taken mostly habitually by common people all over the world. All the citizens of the world are surprised to fealize the fact that there have been a wide variety of noodles developed peculiarly by so many countries in the world. This means that noddles have occupied relatively a great portion among numerous foods means that noodles have occupied relatively a great portion among numerous foods which humen beings have had interest in endlessly since they appeared on the earth. in developing the worldwide common noddle processing plant with which to produce any kind of noddle in the world. 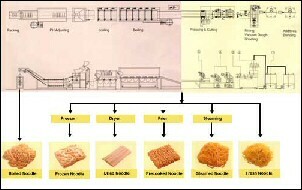 The developed of the vacuum Noddle Processing Plant began from the starting ling of such a goal fo ours. 1) Extemly minute and fine noodle tissue is formed, because in the process of forming noddle sheets, the Vaccum Noddle Processing Plant press initial routh wheat/rice dough, exhaling the mixed air by vacuuming. 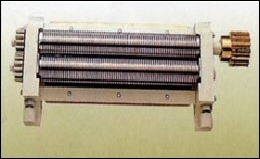 Also any separate/ special maturing apparatus and time is not demanded, because wheat or rice flous mixed homogeneneously with water and a constant temperature is maintained automatically. 2) For forming minute and fine noddle tissue, the Vacuum Noodle Processing Plant does not need multi-step rollers. That is, as it presses dough with a single roller, the Vacuum Noodle Processing Plant will not only cost you a cheaper installation expense, but also can be installed on a smaller space of less than 5m(lengh). Besides, as the Vacuum Nodle Processing Plant forms more minute noddle tissue, the quality of noodle can be maintained for a long theim, the ageing of noodle can be delayed, the period of noodle preservation can be extended. 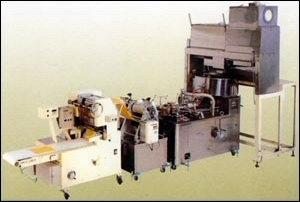 3) As it is full automatized, the Vacuum Noodle Processing Plant is simple to operate. In addition, designed so that it can be assembled or disassembled easily, the Vacuum Noodle Plant is convenient for both cleaing and A/S.